The Toshiba Tecra range of laptops is aimed at business users and comes in a wide number of formats. The Tecra A4 is a widescreen machine that is aimed at desktop replacement users looking for a degree of portability. Toshiba may have opted for a uniform black look with the A4 - a corporate feel more associated with IBM - but the styling of the casing is all Toshiba. The widescreen chassis manages to look slim and appealing without the screen dominating the case. With a tapered styling to the front of the casing, which has a shiny black plastic finish, the A4 is a neat and trim laptop. 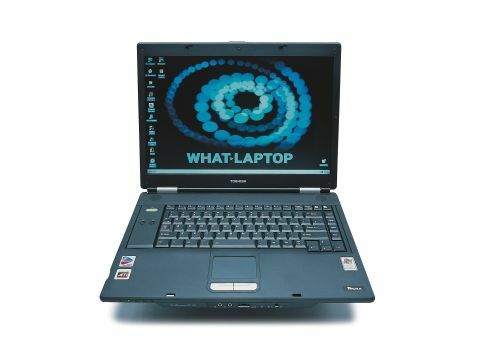 At this price point, the specification consists of an Intel Celeron M 370 processor, which has a clock speed of 1.5GHz. Supported by 256MB DDR SDRAM, the system is a budget solution. If you have slightly more in the way of money to spend, Toshiba offers a higher specification Pentium M 730 with 512MB DDR SDRAM at £1056 (inc. VAT). Regardless of core specification, the A4 comes with a 60GB hard drive, which runs at the slower 4200rpm. When it came to testing, the A4 proved a good machine for daily use. We found that the system ran smoothly and responded well with no signs of lag or delay. Widescreen laptops can often suffer from keyboard placement, with some manufacturers choosing to place the keyboard too far to the left. However, to the left of the keyboard is a small plate, which houses the On button, as well as two quick access keys. This means the keyboard sits firmly in the centre of the chassis and makes for a natural and comfortable typing position. The keyboard has the same feel and spacing as an IBM ThinkPad, but the keys have a great deal of travel, which means the user has to strike quite hard for them to respond. The 15.4-inch widescreen TFT proved to be an extremely bright and impressive display. While it doesn't use Toshiba's UtraBrite technology, we found that image clarity was sharp. Supported by an ATi Mobility Radeon X300 graphics adapter, which is the entry level offering in the new PCI-Express range, 3D graphics are supported through the use of DirectX 9 and OpenGL, with graphics being on a par with the older Mobility Radeon 9700. Wireless connectivity comes in the form of 802.11g, which is also backwards compatible with the slower 802.11b. Supplied with DVD/CD-RW compatibility, users will find Sonic RecordNow and WinDVD for use with the optical drive.